The dew has made an appearance in the forest this week, turning spider webs into frost coloured pieces of art that children have been fascinated with during their morning walk to the morning snack circle. 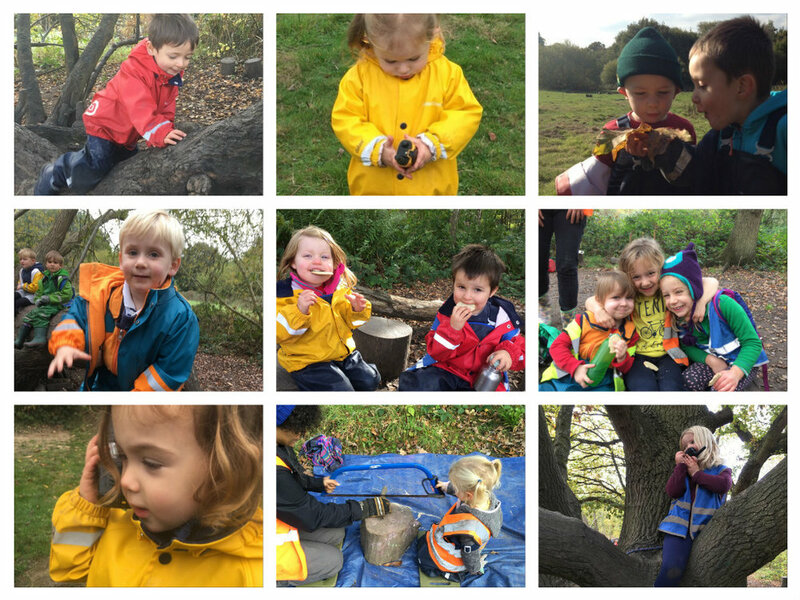 Our Big and Little Forest Folk-ers have been discussing homes that might start appearing in the forest for the animals to use during winter and we have noticed that some of this has fuelled the children’s play. A shelter-building project was initiated by some of our holiday campers at the beginning of the week and this drew other children who wanted to come along and be part of the building team. With supervision, they had explored a tree in base camp that is not so frequently visited and the children began finding large sticks and branches to lay horizontally over two of the tree’s lower branches. The children called this the roof and soon realised that that shorter sticks could be placed where the two branches were close together but the longer sticks would be best used to bridge the wider gap further out. There was a hive of activity as children found one stick after another and discussed where it would best be placed. After lunch, another group of children approached the project with new ideas. They examined the roof and decided that it would be better to start filling the smaller gaps between each stick if the roof was going to be able to do its job – and with that, a fresh collection of sticks were laid out on top of the existing roof in different directions. Having projects like this available for the day means that children get to make a plan of action, evaluate their strategies and make changes in order to reach their goals. We were also super impressed with the children’s abilities to share ideas with one another and even though at times one or two children took on a leadership role, none of these leaders ignored an idea from their team and were happy to give the idea a test. Not only does this strengthen children’s social skills with teamwork and collaboration, but it also develops a firm foundation of leadership skills that the children can keep building upon. Our Little Forest Folk-ers have also really loved the little blank books that the Big Forest Folk-ers have made and they have been narrating some really interesting stories. The educators have helped write their stories down and the children have sat and read them to each other. It has been interesting to see that they are growing a keen awareness of the structure of stories having a beginning, middle and an end. Some of the stories have featured Power Rangers winning battles and a lot of stories featured Elsa and Anna being…frozen! Activities like this build on children’s enjoyment of books and stories and will be an important building block in their development of literacy skills. We hope you have had a fabulous week like we have and we hope you have lovely weekends! Newer PostWandsworth - Jumping in Puddles!